Speaking of the 'Star Wars' program, take a look at this piece of Soviet propaganda from the mid-1980's. This graphic was taken from a Russian magazine at the time that Ronald Reagan was proposing the Strategic Defense Initiative (or 'Star Wars' as it was sometimes derisively called). The intent of the SDI program was to use ground- and space-based systems to protect the US from strategic nuclear missile attack. 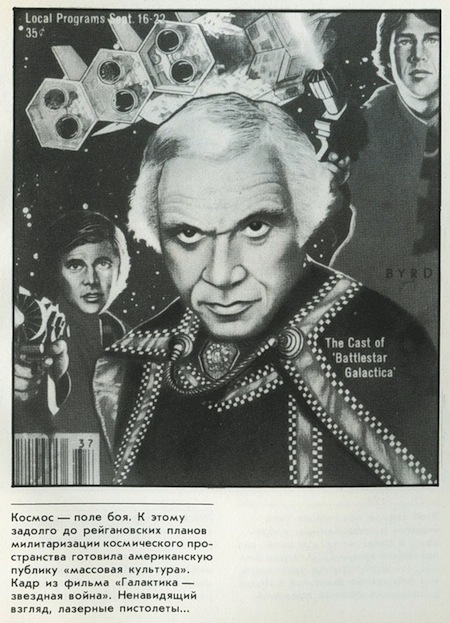 As you can see from this picture (apparently taken from the Americanski TV Guide [take a look at the Battlestar Galactica TV Guide cover], a propaganda rag if I ever saw one), and the accompanying text, American sci-fi was used to 'prove' that the warlike Americans were ready to try anything.